IBO super middleweight champion Chris Eubank Jr. has some big goals in mind - including a showdown with Mexican superstar Canelo Alvarez. Last month, Eubank dominated and retired former IBF world champion and Olympic gold medal winner James DeGale, who went down twice in the twelve round contest. There are several fights that Eubank wants in the coming months, including a rematch with former WBO middleweight champ Billy Joe Saunders, who is now competing at 168-pounds. Saunders handed Eubank the first defeat of his career in November 2014 in a split decision. Frank Warren tried his best to make a rematch over the years, but it never came together. Eubank is hoping that Saunders reclaims a world title to set the stage for a second fight. But he also sees a clash with Canelo in the future. Canelo briefly moved up to super middleweight back in December, and blew away Rocky Fielding to capture the WBA "regular" title. The WBA will still consider Canelo as their secondary champion at the weight - while he drops back to middleweight to defend his WBA, WBC titles against Daniel Jacobs on May 4th. “(A Saunders rematch) will always interest me because of our history, but he doesn’t have a belt, if he has a belt it’ll be different. 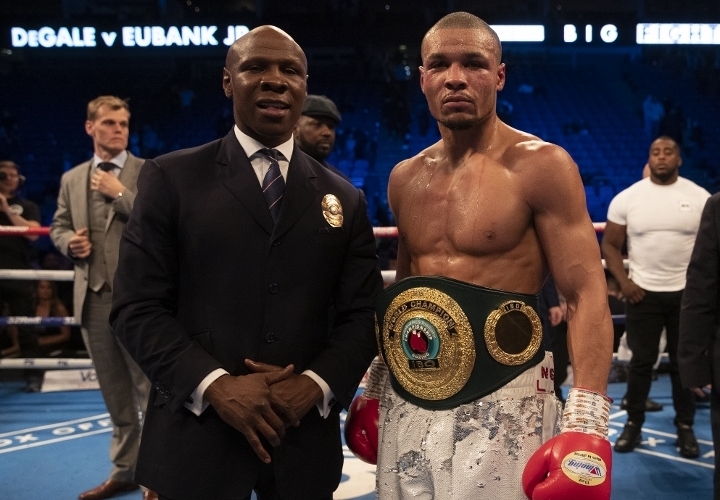 This is why I got into the sport, to be a world champion, to collect the belts, to fight the best and there’s a lot of guys out there that will be great fights for me that have these belts," Eubank told No Filter Boxing. "I want to be active, I want to fight at least three or four times this year. Now we’re looking for collecting belts, there’s a lot of big names out there. A lot of great fights to be made and this year 2019 is going to be very exciting." [QUOTE=Noelanthony;19606657][url]https://goo.gl/images/Mbrx5j[/url] He takes his belt concerts too..smh[/QUOTE] No idea who the guy on the right is, but he's pointing at Eubanks like "the ***** is this guy?"